Block Island National Wildlife Refuge in Rhode Island is the last of the five 2018-dated U.S. quarters. It represents the forty-fifth release from the program of America the Beautiful Quarters® by the United States Mint. 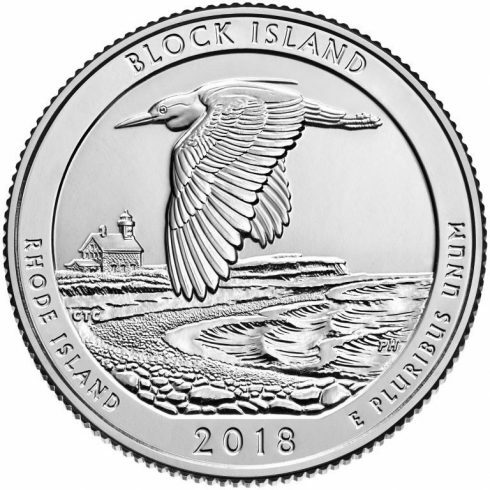 Making the coin more unique is the fact that out of the fifty-six locations to be honored in the series, the Block Island National Wildlife Refuge Quarter is one of only two that depict a wildlife refuge. The other is the 2015 Bombay Hook National Wildlife Refuge quarter for Delaware. a public coin exchange that happens right after the quarter launch ceremony. *Note: Parking for the event is located at Ninigret Park, Rte. 1A, Park Lane, Charlestown, RI 02813. (GPS Coordinates: 41.374504 -71.665873) Shuttles will be provided from 9:00 am to 10:15 am and following the event. Dress warmly for outside tent event. 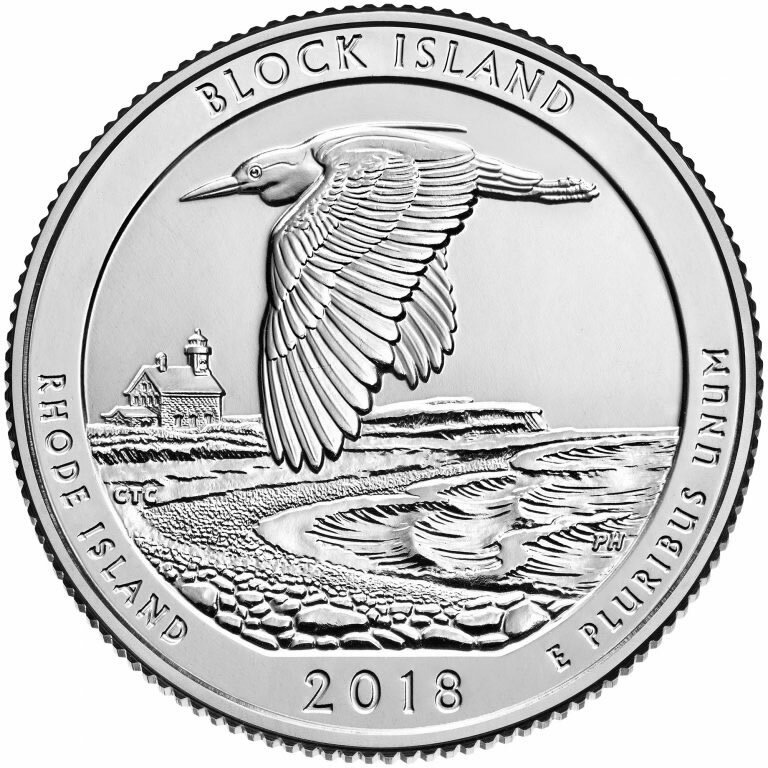 Twelve candidate designs for the quarter were developed by the U.S. Mint in consultation with representatives of Block Island National Wildlife Refuge. The Treasury Secretary selected the final design after the Commission of Fine Arts and the Citizens Coinage Advisory Committee reviewed them. Georgia’s Cumberland Island National Seashore. The America the Beautiful Quarter series celebrates sites of interest like national parks, national forests, and national monuments. One site was selected from each state, the District of Columbia and each of the five U.S. Territories — for the combined 56 locations honored between 2010 and 2021. Block Island National Wildlife Refuge of Rhode Island was established in 1973 from an initial 28 acres of land transferred from the U.S. Coast Guard. Today, the refuge is more than quadruple that size and consists of 134 acres. The island plays temporary home to more than 70 species of migratory songbirds who pass through the area on the Atlantic flyway each fall. Of course, the refuge also hosts other creatures such as the largest gull colony in Rhode Island. A ferry for the island leaves from Point Judith on route 108 in Rhode Island. Once on the island, visitors must head for the north end as that is where the refuge is located.